American comedian, David Sedaris, decided to put his good humor and social critiques to pen and has we authored several books and short essays that slice through cultural inadequacies and political correctness. He has been deemed a master of satire and an expert observer of the current human condition. He was born in 1956, and has many titles......humorist, comedian, author, and radio contributor. He gives credit to radio host, Ira Glass, for discovering him in a Chicago club and giving him the invaluable opportunity to appear on his weekly radio program. He said it was life changing. One of his most important accomplishments would be receiving a Grammy nomination for his audio version of, Let's Explore Diabetes With Owls. There are over ten million copies of his books, and they have been translated into 25 languages. In collaboration with his sister, Amy Sedaris, David has written six plays that have been produced at such places as LA Mama, Lincoln Center, and The Drama Department in New York City. Three have been nominated for Grammys for Best Spoken Word and Best Comedy Album. 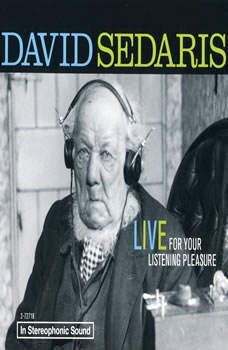 A recent work is David Sedaris: Live for Your Listening Pleasure. He has also had a film adaptation of his story C. O.G., which was presented at Sundance Film Festival. The various books about him and by him are numerous. Calypso, a book of essays, was punished in 2018, and a second volume of diaries is expected in summer of 2019. His older Santaland Diaries was a huge success for listeners, so much so, that the New York Times dubbed him "a minor phenomenon".